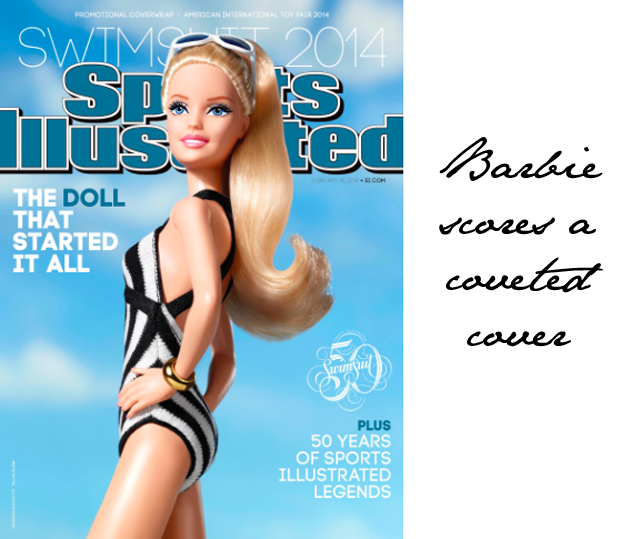 In celebration of Sports Illustrated 50th Swimsuit issue, the magazine has paired up with one of the world's most recognisable woman, or umm doll. Yup, that's Barbie posing like a plastic Christie Brinkley on the cover of Sports Illustrated for a special promotion of the magazine. Oh, and if you are a Barbie lover you'll actually be able to buy miss blondie in her black and white suit at Target shelves this month. Now, onto the controversy. Barbie has been under scrutiny for years because of her unnatural measurements that have been criticized for promoting an unhealthy body image. How ironic that she now makes her cover debut on a magazine that carries the same criticism in featuring photoshopped models. Blogs around the world have picked up on this brilliant bit of irony, especially as Mattel have launched the Barbie for SI campaign with the hashtag #unapologetic. Mummy bloggers, like Mommyish Blog, have taken to social media to bring attention to the campaign with headlines like "The Sport’s Illustrated Swimsuit Issue Will Feature Barbie, So Your Daughter Can Feel Bad Too." The reaction to the article is truly priceless with nearly 100 women commenting on Barbie's new partnership.